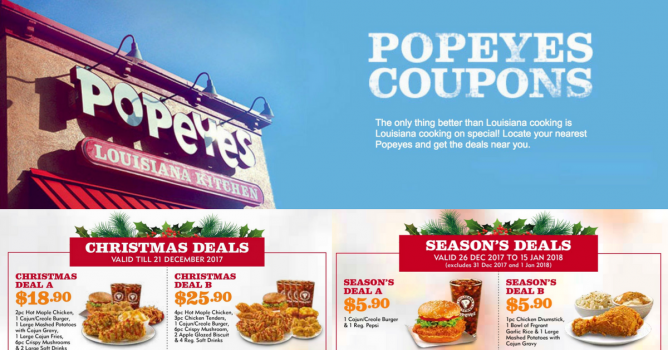 Home > Dining and Gourmet > Fast Food > Popeyes: NEW Coupons for More Savings! Till 15 Jan 2018 Popeyes: NEW Coupons for More Savings! Enjoy the unique American cuisine, Louisiana cooking at Popeyes with their hand battered famous fried chicken blended with their own spices and seasonings. From now till 15 January 2018, you can save more with these awesome dine-in discount coupons at Popeyes! All you need to do is to download and print the coupons, and show to the cashier at the checkout! Popeyes have 13 outlets in Singapore, you can find one near you with the full outlet list here. Previous: [Zalora] You were eyeing these items – trust your taste!